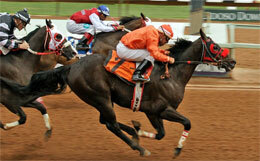 Joker On Jack winning the fifth Rainbow Derby Trial on Saturday at Ruidoso Downs. RUIDOSO DOWNS, NM�JULY 6, 2013�Royal Vista Ranches' stallions WAVE CARVER and PYC PAINT YOUR WAGON each got a finalist Saturday afternoon to the $1,055,000 Rainbow Derby(G1) at Ruidoso Downs. The 10 fastest qualifiers from the nine trial races contested on Saturday will return July 20th and vie for the winner's purse of $443,100. Sudden Thoughts, a WAVE CARVER gelding who finished second behind world champion One Dashing Eagle in 2012 All American Futurity posted the third fastest time of :20.967 seconds after finishing second to fastest qualifier Wicked Courage in the eighth trial. Owned by 21 Partnership, Sudden Thoughts was turned out after the All American Futurity on Labor Day and returned to take an optional-claiming race in April by a neck. He was then a troubled fifth in his Ruidoso Derby trial as the 3-10 favorite. Sudden Thoughts has won three of seven starts and earned $372,200. Jim Pitts bred the gray in New Mexico from the Corona Cartel mare Cee Cee Otoole. Hialeah Laddie Futurity winner Joker On Jack won the fifth trial to post the seventh fastest time of :21.043 seconds. The PYC PAINT YOUR WAGON gelding races for Wade and Jarrett Helton. Corner K Quarter Horses, LLC bred Joker On Jack in Oklahoma form the Six Fortunes mare Miss Six Fortunes. He has won four of 10 starts and earned $162,109. For the complete list of Rainbow Derby finalists, times, sires, dams, owners, breeders, trainers and jockeys CLICK HERE.